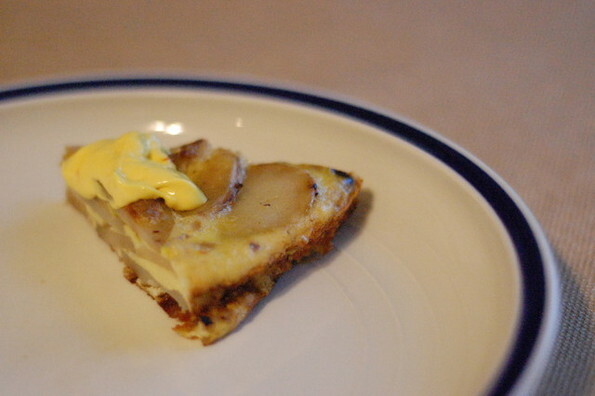 Tortilla Española with Saffron Aioli - You're Making a Mess!You're Making a Mess! Sometimes you make a dish, and you end up with a lot of a certain spice or ingredient left over. Such was the case when I made the Moroccan Beef Meatball Tagine a month ago for Valentine’s Day. The recipe calls for 1/8 tsp of saffron, but The Spice House only sells saffron in bags that have 2-3 teaspoons. With an interesting (and expensive) spice like saffron lying around, I was looking for other ways to use it. Since I was already making Catfish Ceviche, tortilla española seemed to be a good complement to it (even though one is from Spain and the other is from South America). The reviews on the Epicurious page for this dish weren’t glowing, so I checked a few other tortilla recipes. Most called for far more eggs — 10 or so for only 2 potatoes. That seemed like a huge amount of eggs, and I was in the mood for more potatoes than eggs, so I made a few modifications. The potatoes I cut into slices on a mandoline, and cooked them with onions and some oil in a cast iron pan until they were browned nicely. 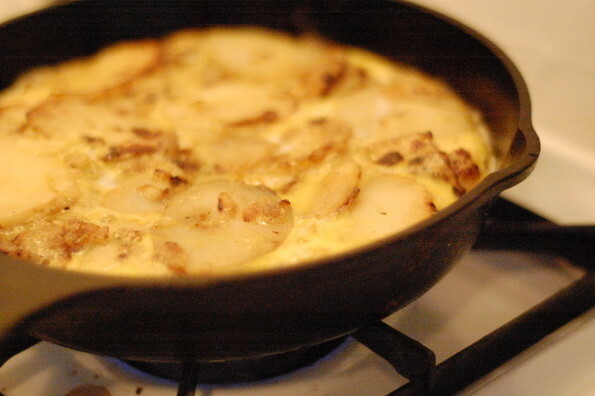 I then beat 4 eggs and tossed them with the potato and egg mixture, which I poured into a 9″ cast iron pan. I cooked everything in the oven for about 20 minutes, and then let it cool to room temperature. The aioli was good, but not amazing. The recipe calls for 1 teaspoon of saffron, which is way too much. Maybe it is written with lower quality saffron in mind, but that amount of the type I had was overpowering. Fortunately, since the aioli is just a flavorful side for the tortilla, too much saffron flavor is easily correctly by just using less. Going forward, I think something more along the lines of 1/4 of a teaspoon would do the trick just fine. All in all, the dish came out well. My modified tortilla had just the right amount of crisped potatoes, egg and onion, and the saffron garlic aioli added some huge flavor when used in small doses.